After much pondering, I voted for the Hillary. Interesting voting factoid about Massachusetts (or at least my town): the Democratic ballots are shaded red, and the Republican blue. Messing with us? Of course they are! 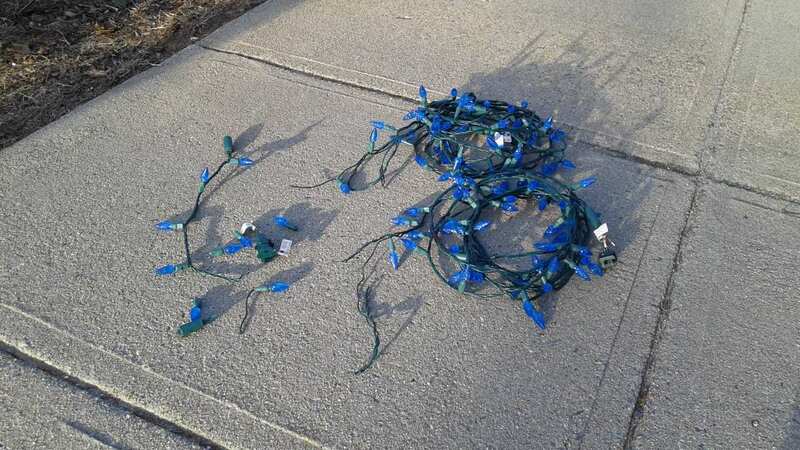 Speaking of messing with us, when I got home, I decided it was a nice day and it was time to take the suddenly failing Christmas lights off the tree in front of our house. (Happy First Day of Meteorological Spring in the Northern Hemisphere, everyone!) I like to keep the lights up after the holidays, to brighten those bleak February nights. Here’s how the squirrels thanked me (and the reason the lights were failing).